Criminal Record Office. Artist associated with 20 portraits. Jennie Baines (1866-1951), Militant suffragette. Sitter in 2 portraits. Lillian Forrester (born 1880), Militant suffragette. Sitter in 3 portraits. Clara Elizabeth Giveen (born 1887), Militant suffragette. Sitter in 2 portraits. Miss Johansen (born 1881? ), Militant suffragette. Sitter in 2 portraits. Lilian Lenton (1891-1972), Militant suffragette. Sitter in 2 portraits. Kitty Marion (Katherina Maria Schafer) (1871-1944), Militant suffragette; Actress. Sitter in 5 portraits. Miriam Pratt (born 1890? ), Militant suffragette. Sitter in 2 portraits. Mary Raleigh Richardson (1889-1961), Militant suffragette. Sitter in 5 portraits. Surveillance photographs of militant Suffragettes were issued to public galleries including the National Portrait Gallery in 1914. 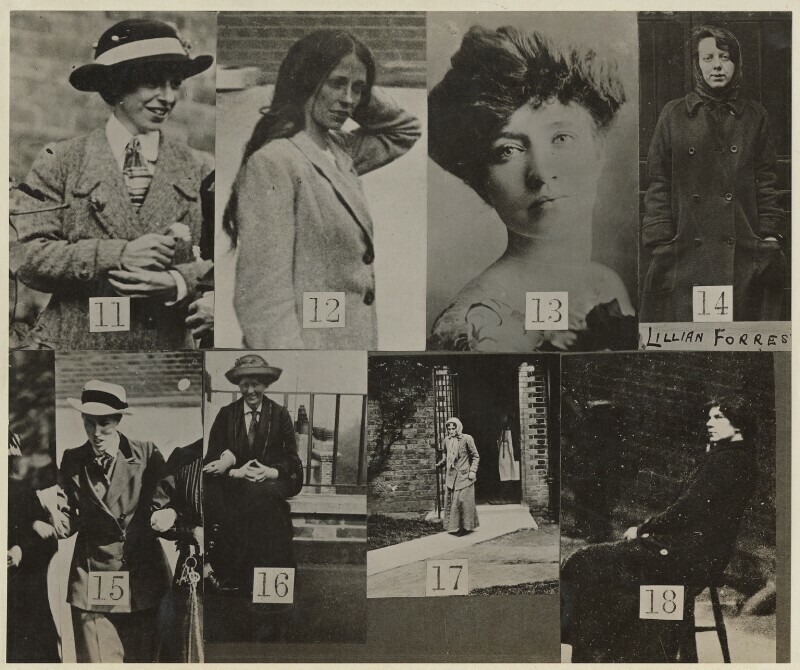 Most of the images in the composite group photograph were taken undercover while the women were in the exercise yards of Manchester or Holloway prisons. While the surveillance photograph lacks any of the understanding between artist and sitter necessary in a portrait, the images are themselves striking and sometimes unintentionally heroic. Of those included, Gertrude Ansell (1861–1932) (below, bottom row, second left), a professional typist, attacked Hubert Herkomer’s portrait of the Duke of Wellington at the Royal Academy and was forcibly fed 236 times. The music-hall actress Kitty Marion is the only subject represented with a professional portrait photograph (above, top row, third right). Imprisoned seven times, her autobiography is a valuable account by a ‘foot soldier’ of the suffrage movement. Following Germany's declaration of war on France and invasion of Belgium, Herbert Henry Asquith, the British Prime Minister, declares war on the German Empire on August 4, 1914. The popular belief that the conflict would be 'over by Christmas' was soon found to be a bitter underestimate of the scale of the war. The fist issue of the periodical Blast is published by Wyndham Lewis, announcing the advent of Vorticism. This movement, named by Ezra Pound and taking in art and poetry, combined the vitality and dynamism of Italian Futurism with the geometric structure of Cubism. Vorticism was a direct challenge to the perceived quaint and domestic style of the Bloomsbury group and Roger Fry's Omega Workshop. On June 28th 1914, Archduke Franz Ferdinand of Austria is assassinated in Sarajevo leading to Austria's declaration of war against Serbia and triggering the First World War. Germany declared war on Serbia's ally, Russia, and then marched on France via Belgium. Soon all of Europe and most of the world was embroiled in total war.